Home › Stock Market › Why 2015 Isn’t Likely To End Well For US Markets? To understand whether or not the bull market is likely to continue, we have to look into the reason for its start. During the financial crisis of 2008 and 2009, the US Federal Reserve enacted new monetary policies in an attempt to stimulate growth in the US economy. The new monetary policy included the implementation of a process known as quantitative easing as well as a lower interest rate; and the plan worked. The quantitative easing made stocks appear to be more advantageous than bonds while the lower interest rate made it so that businesses and consumers had more money to spend; ultimately spurring economic growth. However, when this all started, we knew that it couldn’t last forever. When the US economy was strong enough to stand on its own federal stimulus would end. Although the quantitative easing program has ended, low interest rates are still in effect. 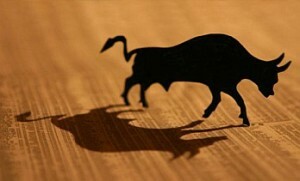 Throughout the past several years, the bull has taken over the market. However, throughout this year, we’ve seen a bit of slow growth; but why? A lot of the decline in growth boils down to the Federal Reserve’s stimulus. While quantitative easing stopped last year, low interest rates are still in effect; but investors know that this won’t last for long. As a matter of fact, the United States Federal Reserve has been planning to increase interest rates by the end of the year. Throughout the year, they’ve been providing hints as to when this is going to happen; and investors are acting more and more bearish as the inevitable gets closer. That’s because low interest rates make it almost impossible for the markets to grow. When interest rates are low, consumers and businesses spend less money on their loans. As a result, more money becomes available for consumer spending a business growth; two pivotal data points in the United States markets. However, when lower interest rates go away, investors know that consumers will have less money to spend while businesses have less money to grow. As a result, stocks will grow at a slower pace as investors aren’t willing to take the large risks we’ve seen recently. Knowing that the Federal Reserve is planning on ending interest rates by the end of the year, we have to imagine that there will be more declines in the market. However, it’s still possible to benefit from these declines. Knowing that the market is headed for more declines gives us the opportunity to purchase put options for profit, as well as trade currency in an attempt to take advantage of the trends. All traders need to do is pay close attention to the trends, and take advantage of tools like MetaTrader4 that uses automated algorithms to the types of trades needed to turn this trends into profits. So, keep your eye on the US economy and US market, because several opportunities are likely to arise. Where do you think the US markets are headed and why? Let us know in the comments below! June 23, 2015 Why 2015 Isn’t Likely To End Well For US Markets?